An asymetrical offside one band slide with adjustable velcro closure on instep strap. Leather linings. 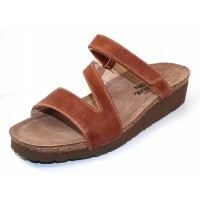 Suede padded anatomically designed contoured footbed. Cork midsole. EVA sole. 1 1/2 inch heel. Made in Israel. Part of the Elegant Collection. Fits narrow to medium width. An asymetrical offside one band slide with adjustable velcro closure on instep strap. Leather linin..